Be the first to share your favorite memory, photo or story of Mary Ruth. This memorial page is dedicated for family, friends and future generations to celebrate the life of their loved one. 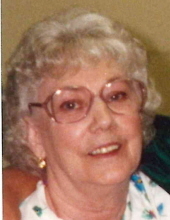 Mrs. Mary Ruth Call Foster, age 89 of North Wilkesboro, died Saturday, April 6, 2019 at her home. Funeral services will be held 2:00 PM Tuesday, April 9, 2019 at Fishing Creek Arbor Baptist Church with Rev. David Wellborn officiating. Burial will be in the church cemetery. The family will receive friends Tuesday from 1:00 until 2:00 PM prior to the service at the church. Mrs. Foster was born June 28, 1929 in Wilkes County to Barney and Minnie Eller Benton Call. She worked at Ithaca and was an accomplished seamstress, enjoyed needlepoint, and was a great mother and grandmother. She was preceded in death by per parents; a son-in-law, Butch Williams; one sister, Nora “Jypies” Benton Shew; two brothers, Harden Benton and Sylvester “Pate” Benton; and two grandsons, Danny Alan Williams and Coach Barry Lee Williams. She is survived by two daughters, Peggy Ann Porter and husband, Albert, and Patsy Call Williams, both of North Wilkesboro; one grandson, Terry Porter; and two great-grandchildren, Cody Lynn Porter and Dillan Theodore Porter; one sister, Sallie Benton Shew of North Wilkesboro. Flowers will be accepted or memorials made to Fishing Creek Arbor Cemetery Fund, 2446 Fishing Creek Arbor Road, Wilkesboro NC 28697. To send flowers or a remembrance gift to the family of Mary Ruth Call Foster, please visit our Tribute Store. "Email Address" would like to share the life celebration of Mary Ruth Call Foster. Click on the "link" to go to share a favorite memory or leave a condolence message for the family.